After witnessing an act of unprecedented violence without even flinching, an emotionally numb real-estate agent visits his ailing mother at the hospital, and then, the graveyard. Is there a speck of happiness in this cruel and short life? An educational film about AIDS contracted by the Swedish National Board of Health and Welfare, later to be withdrawn due to its controversial content. The psychiatrist: Oh dear, oh dear, oh dear. A lovely aerial view of a major city turns ominous with the approach of a fleet of airplane bombers; an irate hairdresser reacting to a perceived racial slur cuts a road through a businessman's bushy hair; a man dreams of being dragged to an electric chair after a failed magic trick and a teacher breaks down in front of her grade school class because her husband called her a hag. 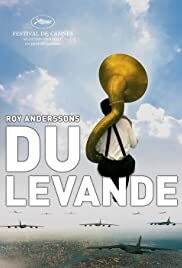 These and about fifty other vignettes that run the gamut from the outright depressing to the wildly humorous to the joyously uplifting populate Roy Andersson's You, the Living, his first feature since his critically acclaimed if commercially unsuccessful Songs From the Second Floor. You, the Living is filled with the same kind of imaginative set-pieces as Songs, replete with black humor, surreal situations, and strange looking characters. Though a bit overlong and less focused than his earlier work, what remains constant is Andersson's unmistakable style with its stationary camera, sterile-looking backgrounds, and precise attention to detail. If there is a theme that ties the sketches together, it is that our time on Earth is limited and "tomorrow's another day', so let's treat each other with kindness. Along the way, we are entertained by tuba and drum music from the Louisiana Brass Band, dinner guests at a banquet hall standing on their chairs singing a rousing song, and a house that turns into a moving train. The emotions range from the gloom of a daughter attempting to communicate with an Alzheimer's patient to a young woman's ecstatic dream about marrying a handsome guitar-player named Micke to the cheers of a crowd of onlookers. While there is no continuous narrative thread, the theme of greed and desperation appears in several sketches. The first of these threads features two corpulent individuals and their tiny dog sitting on a park bench, the woman bewailing the fact that no one understands or loves her, yet she blithely ignores the man's comforting and reassuring words. There is also a hefty admixture of irony. During what seems to be an executive luncheon, one man tells another on the phone that workers don't appreciate quality and how nice it is to appreciate money and the things that it can buy such as fine wine. When he is not looking, however, a man at an adjacent table calmly lifts his wallet from his jacket on the back of his chair. Though Andersson's cynicism is at times not very well hidden, You the Living has an underlying humanism that shows compassion for the human condition. It is a cautionary tale that looks at the mess we humans have gotten ourselves into but suggests there is still time to turn it around, if we heed the warning of the poet Goethe that opens the film, "Be pleased then, you the living, in your delightfully warmed bed, before Lethe's ice-cold wave will lick your escaping foot." 37 of 44 people found this review helpful. Was this review helpful to you?